Look, I could be cynical and cranky about the holidays arriving too early and being too commercial, but the facts are: the squirrels have eaten through the jack-o-lanterns, I just turned back our clocks, a cold front passed through today bringing in a chilly wind from the north, and the mail carrier has delivered roughly two dozen catalogs over the last two days. Smells like the holidays are here in the Midwest - let's make the most of them! So, that means it's not too early to drag out the holiday tunes. What's your cup o' eggnog, Bing Crosby? A Very Special Christmas? Mannheim Steamroller? Beatles rarities? Amy Grant? For a holiday all about tradition and comfort, I'll be the first to admit it's tough to feel the spirit in newly penned tunes. 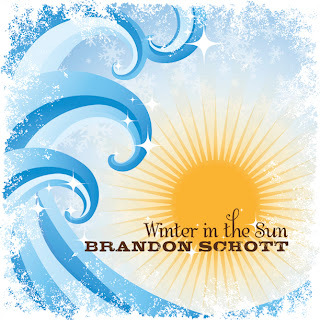 Brandon Schott's new holiday tune Winter in the Sun does what very few "modern" holiday tunes can do - the damn thing actually puts you in the mood! Visit hisspace to hear for yourself. Rather than preserve some manufactured hipster cred like too many contemporaries try to do with their seemingly contractually obligated holiday tunes, Brandon embraces universal feelings with Winter in the Sun and actually celebrates Christmas and the warmth of the time. Literally. Living in Iowa, I'm dreaming more of a white Christmas than a winter in the sun, but the tune is so catchy and the theme so familiar that I have no problem relating. Winter in the Sun is bit of Beach Boy sunniness in a Ben Foldsian modern voice with Jellyfish eccentricities thrown in just because he can handle it. It's definitely modern, but he's earned a spot in my holiday rotation that is normally heavy on the classics. Winter in the Sun will officially be released November 13 on iTunes. It'll be bundled with his stellar Golden State if purchased through his website. Merry Christmas.